It won’t be as big, but the good news is that it WILL BE. 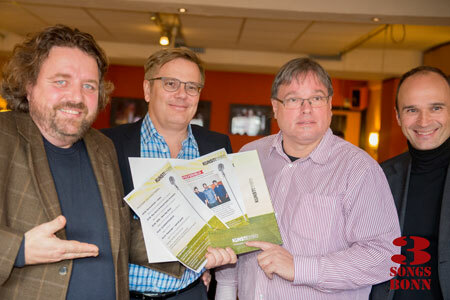 That was the bottom line at todays’ Press Conference to announce the plans for next years Kunst!Rasen season. It’s still early days and more is to come, but Ernst Ludwig Hartz and Martin Nötzel were in a determined mood. “Kultur ist wann Mann es trotzdem macht” (Culture is when it happens despite everything). That was the Kunst!Rasen motto in 2012 and the fact that Ernst Ludwig Hartz reiterated it again in 2014 is a sign of the fighting spirit that prevails to bring top open-air entertainment to Bonn. When a reporter jokingly suggested that perhaps they would be more welcome relocating to Bad Neuenahr (new location for the ill fated Klangwelle in Bonn) Martin Nötzel’s response was unequivocal: “We will stay in Bonn!”. Clear on all faces was the disappointment that despite intensive searching, not a single partner could be found in Bonn itself to share the financial burden. Unlike Cologne’s Tanzbrunnen, the Kunstrasen has to be built and dismantled every year right down to the provision of drainage and every kind of infrastructure. 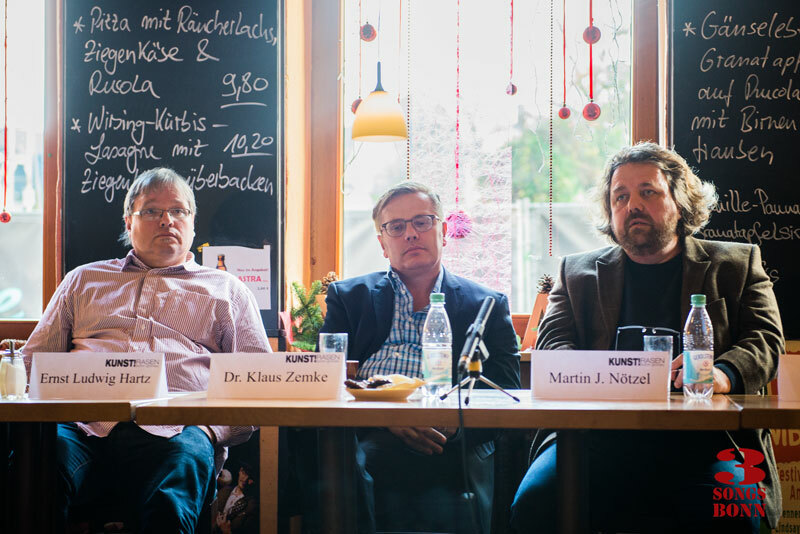 Bonn itself is in a financial straitjacket these days and could not offer support over the longer period that is required to really put the concerts on ‘literally’ solid ground, hence the man sitting between Hartz and Nötzel – Dr Klaus Zemke, managing director of Ticketmaster, the World Leader in Ticketing. Whatever the involvement of Ticketmaster might mean to the marketing of next years Open Air Season Martin Nötzel put it very clearly – without Ticketmasters support there would have been no Kunst!Rasen 2015. So what will the stresses and strains of this years seemingly endless legal battles allow in 2015? Most notably, the main Kunst!Rasen Season itself will be a short one – Just three and a half weeks to be precise. It will also have a less International flavour. Currently inked in are Hamburg Rockers Revolverheld and Stuttgart Hip-hopper Max Herre with the Kahedi Radio Orchestra. Despite his stage name, Mike Rosenberg hails from up the road to my UK hometown- Brighton to be exact.He will be bringing his Folk-Rock Passenger sound to Bonn on July 3rd and is on a success roll presently having had his single ‘Let Her Go’ nominated for a ‘Brit Award’ as single of the year in 2014. There is space for up to eleven major concerts so more will come, and possibly big names amongst them, so stay tuned. Last years ‘Klassik Picknick’ was, through no fault of the promoters or the musicians, something of a disaster. Thunder and lightning turned it into what Beethoven Orchestra Bonn’s Orchestral Director Michael Horn described as something of a mud-bath involving around 1000 bathers. In 2015 it’s been somewhat re-worked as an ‘After Job Party’ event starting at 7pm on a Thursday (4 July) and with free admission again is aimed at attracting new disciples to the Classical Music Scene. Extra ‘Picnic’ table’ offers will, as last year, be available for purchase. Very good news indeed is that the Kunst!Garten will be putting up ‘shop’ again down by the lake. It’s really become a highlight of Summer to go along there, ‘see what’s going on’ and even if nothing is ‘going on’ just enjoy a glass of wine or beer in the sunshine. There will be ample opportunity for such relaxation too in 2015 as the Kunst!Garten Season will start on 22 May and run until the first week in October. Musicians interested in bagging one of the circa 80 live spots on the mini stage should contact kunstgarten@kunstrasen-bonn.de for more information. It was important to make the stage available to everyone said Martin Nötzel. If you want to make money though bring a hat or a CD – there is no payment from the promoter, only the opportunity of fame, not fortune, so to speak. So there you have it. Maybe not something for everyone, but something for most people to at least check out. As ever, Martin Nötzel brought the Season ‘auf dem Punkt’: Vote with your feet. If enough people support the shows physically then sponsors will start following their example. If you are in two minds about going to a show – go! Nötzel describes the Season as “A ‘Bomben’ (super) programme for a City with 300.000 inhabitants”. Support the events next year and maybe it won’t be too long before shows here make bigger Cities than Bonn jealous again.